Pre Liposuction to the hips. Patients who are considering liposuction should always have sufficient information at their disposal; this is one of the reasons why Dr Lanzer makes several case studies available to patients on the website. Case study 29 is one such a case study, where you can view a real-life example of liposuction as well as gain more information about this procedure. How Much Fat Can Be Removed from the Hips During a Liposuction Procedure Like This? Hips is an area where I tend to be very aggressive and try and get out as much fat as I can. I find that this really proves the curvature of the body, creating a really nice waistline. Also, by bringing the curvature on the hips, one enhances the convex curvature of the buttock giving a more Brazilian appearance to the body. Youthful shape comes from curvature rather than straight shadows. How Much Fat Was Removed from This Lady? Approximately 2.5 litres of fat were removed from the hips. 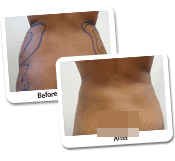 However, patients must consider that fat removal varies from patient to patient. Some patients will require the removal of higher volumes of fat, while other patients require less. How Did You Get the Skin to Contract So Well? There are a number of techniques to enhance skin contraction. One is to remove as much fat as possible. This is called the superficial liposculpture method. The second is to treat the skin very close to the skin and use devices that enhance skin contraction. The tumescent liposuction method also enhances skin contraction together with the MicroAire device. How Important Is It to Wear Garments After Liposculpture in This Area? Garments help the results by enhancing the skin contraction and allow all the canals that we produce with the liposculpture canula to close up. Wearing correct compression garments also enables the treatment area to conform to its new shape, subsequently giving the patient a better result. What Do the X’s Mean on the Skin Marking? 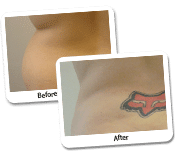 X’s mean that there is a large convex bulging of fat and this is where more fat is removed. Does This Patient Need to Lose Weight? No, there is no necessity to lose weight but rather just keep their current health the same. Is It Likely That Fat Will Return in This Area? It is unlikely that it will recur in this region. Liposuction tends to be long lasting and probably more long term. Are There Non-Surgical Ways to Remove Fat? Yes, we use the Cool Shape, which is a variant of the Cool Sculpt. 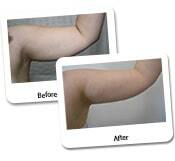 We also have used ultrasound such as Ultra Shape in the past for non-surgical fat reduction. Unfortunately, even though these procedures can eliminate some of the fats, they can never remove the amount of fat as seen in this case.